Beyond stamped concrete, franchisees get exclusive branding, training, tooling, and support for a competitive edge. With the economy improving, business is growing for residential and commercial concrete contractors, if they can deliver the quality required. Realtor.com’s 2016 housing forecast predicts new construction to drive the highest home sales since 2006, with six million homes sold in the new year. A recent Forbes story forecasts that housing construction and home prices will rise in 2016 and 2017. Opportunities abound in hardscaping – from residential pools, patios, floors, walkways, and concrete driveways to malls, event halls, waterfronts, sport courts, skate parks, theme parks, business parks, hotels and hospitality. However, decorative concrete projects increasingly need to meet architectural design specifications or aesthetically match existing work. Yet typical stamped concrete is not always up to the task, particularly when stamp quality is insufficient and training is limited to the usual one-day seminar provided by some stamping tool manufacturers. To grow their businesses and take advantage of hardscaping opportunities, proactive concrete contractors are turning to Patterned Concrete®, a name familiar for decades and often used interchangeably – incorrectly so – with the generic term stamped concrete. Patterned Concrete® is actually a registered name and trademarked brand of stamped concrete with industry expertise that goes back to 1972. The brand has expanded throughout North America and now includes franchisees in both the U.S. and Canada. Beyond stamped concrete, its franchisees get exclusive branding, marketing, training, tooling, and support for a competitive edge. 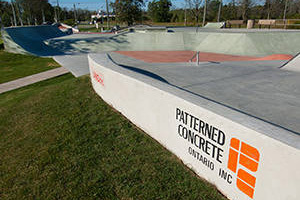 “The Patterned Concrete® brand helps us win jobs because everyone knows the name,” says Rodriguez. In the residential market, homeowners’ trust in the brand can be a deciding factor in winning a hardscaping job. According to Padula, even though individual franchisees solicit sales in their designated territory, the company provides promotional support in various media as well as a healthy supply of sales leads from inquiries within their sales territory. This has helped to build Padula’s business much faster than he and his partners could have achieved on their own. “Even though we had decorative concrete experience before becoming a franchisee, the Patterned Concrete® brand gave us the edge with customers because they knew we had been thoroughly trained, had a reputation to uphold, and would be held accountable for our work,” says Padula. Unlike typical soft rubber stamps in the industry that lack sufficient detail, Patterned Concrete® stamps are imprinted from true pieces of stone and other natural materials to produce a textured, authentic look. As such, the pattern for Old English Brick displays worn out identification stamps in the brick; Adoquin has a volcanic look with course ridges, chisel marks, and craters; and Board comes complete with nail holes. Some patterns, in fact, are deep enough to be grouted for an even more authentic look. Because franchisees can rent stamps from Patterned Concrete® corporate or any franchisee, they have full access to any style required without having to own every tool. Currently, the company offers over 30 unique styles in a number of sizes. “The textures are seamless and we can give customers an authentic look in any style they want from wood, slate, and brick to cobblestone, herringbone, and random cut flag,” adds Padula. When the need arises, the company will even create new custom patterns at a reasonable cost. Though the stamps of franchisees are made with great attention to detail, they are also made to last. “I have been using my original Patterned Concrete® stamps since 1992 and they are still performing well,” says Rodriguez. Though the typical one-day, stamped concrete class offered by stamp manufacturers may be enough to get a contractor started, it is just as likely to get him in trouble according to Rodriguez. While Rodriguez and her husband had almost two decades of textured concrete pool deck experience before becoming franchisees, they found the Patterned Concrete® training they received invaluable for developing their business. Because franchisees have exclusive territories and are routed sales leads, the relationship with other franchisees is cooperative rather than competitive. After decades in the business, a highlight of the year for Rodriguez is the annual Patterned Concrete® convention. There she and other franchisees learn the latest techniques, and share tried-and-true tips with each other. “As franchisees, we work as a team because the brand is stronger when we all succeed,” says Rodriguez. Another advantage of working as a franchisee is that the corporate office tracks all jobs to ensure a consistent, quality match when future repair or renovation is required. Specs including footages, color and pattern used on the project are logged into a central database at the company’s headquarters. This allows the franchisee to match previous work at any later time.